New Star Wars Mimobots Are Available For A Short Time | OhGizmo! By Chris Scott Barr on 02/22/08 • Leave a comment! Every day I see a handful of new flash drives that claim to look “new and exciting.” Unfortunately that seems to be marketing-speak for either “same as everything else” or “really strange”. However, the Mimobot line of drives always have something cool to look at. One of the fastest-selling sets of Mimobots were the Star Wars set. In light of the quick sales, they have decided to launch “Series 2”. 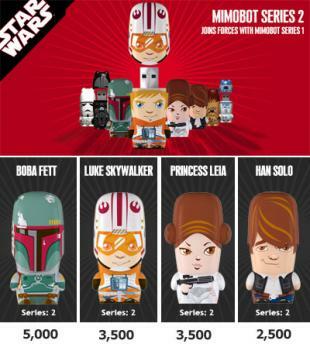 You’ll have your pick of Boba Fett, Luke Skywalker, Princess Leia or Han Solo. The drives are limited, so you’ll have to act fast if you want one. You’ll be able to pick from sizes ranging from 1GB to 4GB with prices starting at $50.